Most witches consider their spiritual space to be their magikal circle. A magik circle is a space where a Witch will conduct rituals and ceremonies. It is the gateway between worlds, spiritual and physical realms come together and allow you to communicate with spirit, conduct spiritual work, rituals, ceremonies and castings. As with everything in the spiritual essence of the world, even a circle has a few guidelines that need to be followed. The circle is not to be broken by someone stepping into this space unless a gateway has been prepared for them to enter. Nor should a Witch step outside the circle during a ritual unless a door way has been prepared. A circle is used to draw a visionary boundary that protects a Witch from outside forces while conducting spiritual work. Many witches use visions of blue flames or divine white protection to create this boundary. Others choose to create this circle in the physical sense as well. Either by drawing a circle on the floor in a permanent means, or by using a nine-foot cord made from natural fibers that can be easily placed and removed as needed. 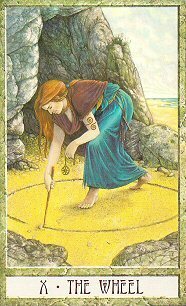 Sand, salt or herbs can also be used to draw the circle. The important aspect of circles is that it is your space. And you must feel comfortable and secure while youre within its boundaries. When you have selected the area to place your circle, you should Clear and Cleanse the energies before you draw the circle. Many Witches will place a broom at the doorway of the circle as a tool that designates the entry point of the witch or someone else who will be called into this space for work. The broom is also a symbol of a spiritual barrier to keep out unwanted energies from entering your sacred space. To draw a doorway, a Witch should use a wand or athame to cut a "hole" in the energy field. Many Witches will use incense to close the doorway, using the smoke to symbolize the divine energy field. Once your work is complete, you must close the circle and ensure the energy has been properly shut down. Leaving an open gate is not only disrespectful to the forces that assisted you, but also dangerous for you and your home. Closing the circle is as simple as 1-2-3. Thank the guides, teachers, God/Goddess that you called or who came into the circle to offer assistance during your work. Imagine the energy around the circle lowering around you, toning down and fading so to speak. Finally, clear the space with a blessing and ask the energies to close the gate. If the circle was a temporary fixture, then remove it and store it appropriately.